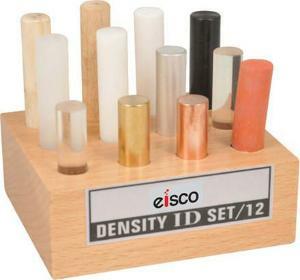 The Density ID set offers hands-on learning on the concept of density. The set includes 12 cylindrical bars of different lengths and materials. A wooden holder stores the set. Ordering information: This set includes hardwood (oak), softwood (pine), aluminum, copper, brass, rubber, nylon, plc., Delrin (polyoxymethylene), glass, Lucite, and Teflon.